Invisible in the back of the class, 10th-grade loner Yugi always had his head in some game - until he solved the Millennium Puzzle, an Egyptian artifact containing the spirit of a master gambler from the age of the pharaohs! 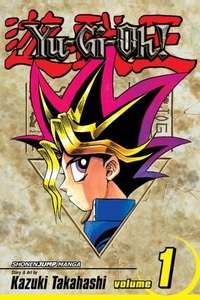 Awakened after 3,000 years, the King of Games possesses Yugi, recklessly challenging evildoers to the Shadow Games, where even the most ordinary bet may result in weirdness beyond belief ... and the loser losing their mind! Who will win the Game of Silence? Who will win the Game of One Digit - Yugi's thumb or a violent criminal's finger on the trigger of a gun? And what about the Game of Air Hockey With Explosives Over a Hot Stove? This exciting mega-hit is printed in the original right-to-left Japanese format. Let the games begin!